In this monthly blog series, our collections team write about their Object of the Month, chosen from our collection. In this month’s blog, Stuart Ivinson, Librarian at the Royal Armouries Museum in Leeds, explores the history of the treasured manuscript I.33, ahead of the publication of Jeffrey Forgeng’s latest transcription. One of the oldest and most enigmatic treasures in the Royal Armouries archives is the Royal Armouries I.33 manuscript, a surviving example of a Fechtbuch, or Fight Book. 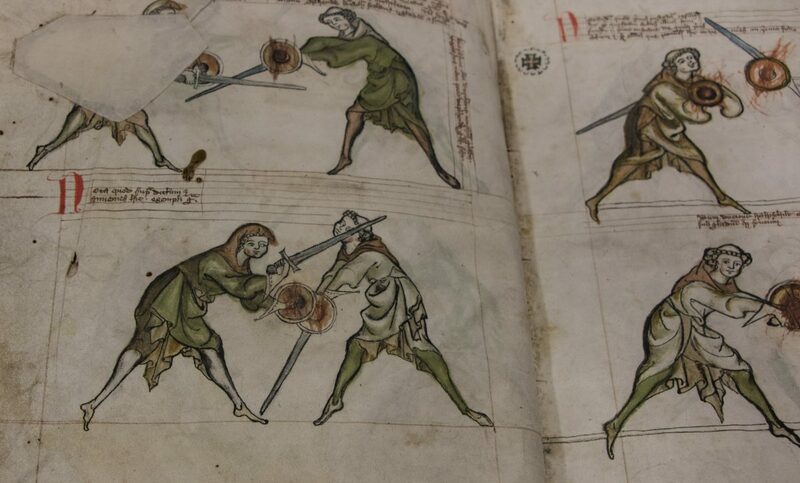 This particular manual was produced in Germany in the early 14th century and it documents historical martial arts techniques through a number of illustrated pages. We don’t know who it was written by or for, or even why it was written, but what we do know is that it is the oldest known European fencing manual anywhere in existence. 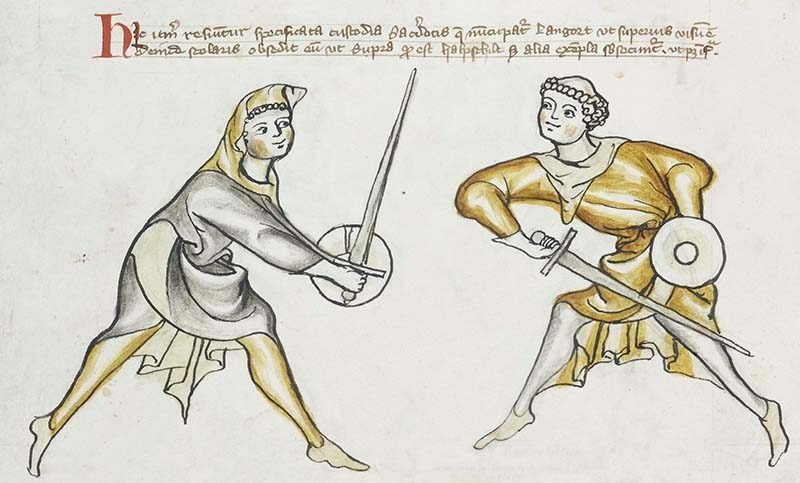 The text and images in I.33 outline a system of fencing with the sword and buckler. The system includes seven basic guards, referred to as custodia. In its current form, the manuscript contains over 36 different sequences or plays, some of which are longer and more complicated than others, and some now incomplete. Predominantly, two characters are illustrated in the text; a priest and a scholar, with the priest taking on the lead role in most of the sequences. In the last couple of pages, the scholar – possibly fed up with having been beaten in most of the preceding sequences – is replaced by a woman named Walpurgis. 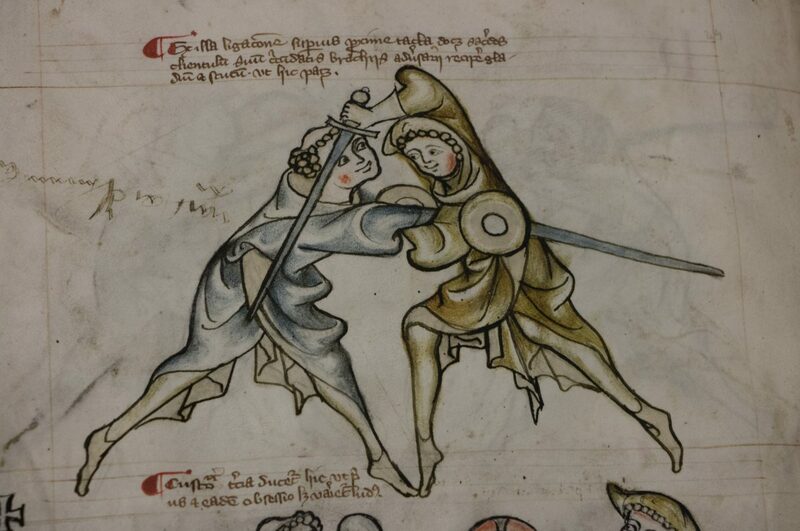 This leaves us with some rather nice images of two classes of medieval society interacting in a way that we wouldn’t usually expect: a priest and a woman having a fight. 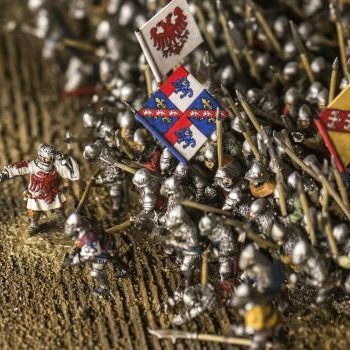 The manuscript is undoubtedly one of the jewels of the Royal Armouries collection here in Leeds, but over the years it’s had a rather chequered history. It’s had a number of different homes and has been the spoils of war at least once. It has been damaged in several places; burned, scribbled on, graffitied, disbound, and in its current condition there are many pages missing. The surviving manuscript itself isn’t in the best condition either – the vellum or calfskin it is written on is variable in thickness and quality, and the layout of the pages is in places quite messy, with text and illustrations going over the ruled lines marked on the pages. Though there may be better quality medieval manuscripts in existence, I.33 is unique, and battered pages contain many clues to its colourful past. Over the years scholars have suggested various dates for the production of the manuscript, from the late 13th through to the 15th century. The current belief, using the artistic style and the type of clothing worn by the female character as guides, is that a date of around 1320-1330 is about right. A close scrutiny of the text reveals that the surviving manuscript was the work of at least two scribes, and several artists were responsible for the illustrations. This small workforce was presumably guided by a single author, but we do not know who he was. There is a reference on the second page to a gentleman named Luitger, who may or may not have been the author or fight master behind the system that the manuscript depicts. It’s first known home was a monastery in Franconia in Germany, but as it is not recorded there until the mid 16th century, it is probable that it was not produced at the monastery, or necessarily even in that region of Germany. The manuscript was taken from the monastery by a soldier named Johannes Herbart von Wurzburg, who served as Fencing Master to Friedrich Wilhelm, the duke of Saxe-Weimar, during a military campaign in that region during the 1550s. Johannes presumably recognized the manuscript as being of interest and took it when the monastery was looted. He even went as far as leaving his name as graffiti on one of the pages, before passing the manuscript to his master. From Friedrich Wilhelm the manuscript passed into the hands of the dukes of Saxe-Gotha, and it was catalogued into the Gotha ducal library with the shelfmark of I.115. Throughout this period from the 16th – 19th century the manuscript was referenced and discussed in numerous German scholarly works on fencing – including tantalizing glimpses of what may have been some of the missing pages. It was featured in an exhibition as part of the 1936 Berlin Olympics but then disappears from the historical record until 1950, when it appeared for sale at Sotheby’s in London. It was purchased by the Royal Armouries and went into the collection at the Tower of London, where it was largely unregarded for the next 40 years. The manuscript then came to the attention of Dr Jeffrey Forgeng, then of the Higgins Armoury Museum, who was probably the first post-war scholar to realise the significance of what he was looking at, and it was he who brought the manuscript to the attention of modern audiences. This rediscovery of I.33 has coincided with a resurgence in interest in European historical martial arts over the past 20 – 25 years, and has ensured that the manuscript has remained at the forefront of interest and debate. Numerous books have been written about or have included references to it, in various languages, including full facsimile editions with translations and commentary. As interest in European martial arts continues to grow, so too does the interest and scrutiny of the source material – the European Fechtbuch tradition, and I.33 in particular. The manuscript left Leeds for a few months in 2012 and went on display at the Wallace Collection in London. We took the opportunity then to rebind and photograph the manuscript. The old binding was 19th-century pasteboard, which restricted the opening of the pages because it was tight. The new binding is of limp vellum, and allows the book to fall open more naturally and is much better for the conservation of the manuscript. We have kept the old binding and its inserts, as although not the original cover, it is still a part of the manuscripts’ history. 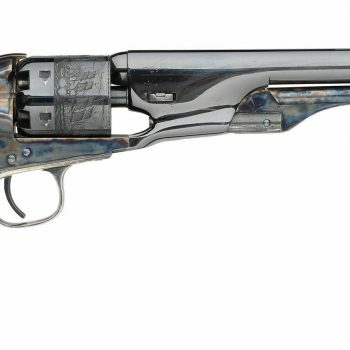 Broadly speaking the surviving German Fechbucher follow a continuous tradition. Starting with the teachings of Fencing Master Johannes Liechtenauer in the 14th century through to the Early 16th, the martial art evolved as numerous fencing masters added their own glosses and flourishes. I.33 stands outside this tradition. It is both older – by several decades – but also teaches a style of combat that is considerably different to that of the main tradition. No other manuscript covers the use of sword and buckler as fully, or sequentially as I.33 does. With most fight books the images are stand alone snapshots of a given action; whereas 1.33 shows entire sequences or plays in step by step illustrations with explanatory text. Each new play is denoted by a cross in the margin. It is a highly evolved system of fencing, and comes across through the illustrations as being fast and dynamic. Although the manuscript alone could not teach you how to fight with a sword and buckler from scratch, it certainly gives a good overview of the system it represents. One thing to bear in mind when talking about Fechtbucher, is that what survives for us today is not necessarily everything that was written then. It is probable that numerous others were written and have now been lost to us, or only survive as brief snippets in other works. 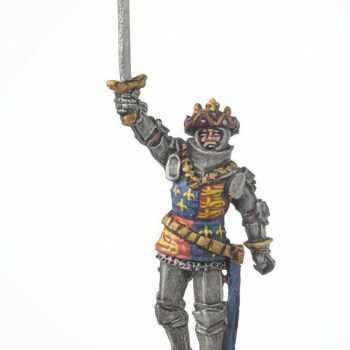 This raises the possibility that in its own time I.33 was not as unique as we think of it now, and may only have been one of a number of similar works on the sword and buckler. This is a theory put forward by Jeffrey Forgeng, and others, and it is given credence by the fact that some sections of later 16th century manuscripts depicting sword and buckler combat, do so in a way that looks quite similar to I.33. Although many years of research by numerous scholars have answered a lot of the questions about I.33, it hasn’t answered them all. We don’t know exactly when or where the manuscript was written, by whom, for whom or even why it was written. We don’t know who Walpurgis was, or why she was having a fight with a priest. 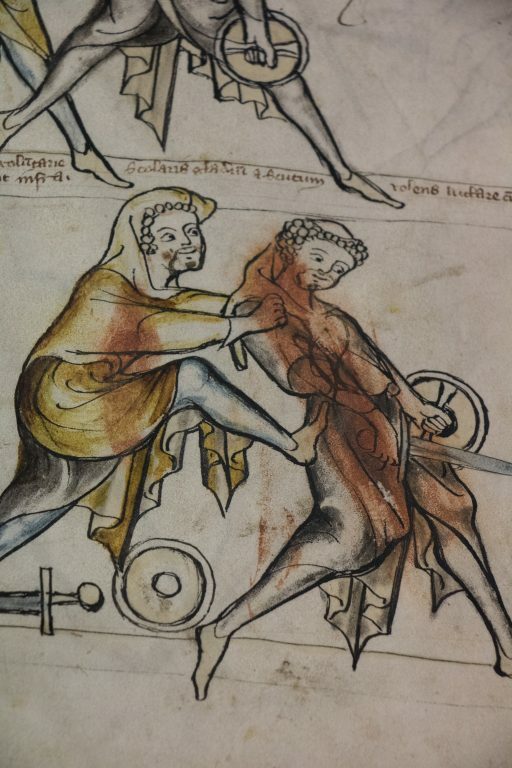 Although we may have a decent understanding of the combat techniques contained within the manuscript, I.33 continues to be at least a partial mystery; and that, I think, is why it continues to fascinate us quite so much. As the librarian at the Royal Armouries, I have the privilege of being I.33s current custodian. One question that recurs quite often is about the true name of the manuscript because it has had several over the years. For example, it is sometimes referred to as the Walpurgis Fechtbuch after the female character, or the Tower Fechtbuch – because it resided at the Tower of London when we first bought it. More commonly though it is referred to simply as I.33; and – and this is important – it is a Roman numeral 1, NOT a capital letter I. This is because I.33 was the class number assigned to the manuscript when it was catalogued into our collection. Back then Class I was art and archive material, so should be Royal Armouries Manuscript Class I no. 33 – shortened to I.33 for convenience. Nowadays archive material is referred to under its own designation RAR – Royal Armouries Record, so the current correct name for the manuscript is Royal Armouries Record 0033. However, I.33 is the popular term that it’s adoring public still use to refer to it, and I can’t see that changing anytime soon. View more images from I.33 on our collections online. Jeffrey Forgeng’s latest translation is also available to order through the Royal Armouries Shop.